On an island of music, the Drum Dream Girl imagines playing the drums – but she is told over and over again that only boys can play. Drum Dream Girl hears the rhythm wherever she goes and taps along, until finally her music is heard in public and celebrated by all. Margarita Engle’s Drum Dream Girl is inspired by Millo Castro Zaldarriaga, who played despite Cuba’s taboo against female drummers in the 1930s. She performed with her older sisters in an all-female band called Anacaona, and became known worldwide for her abilities. Zaldarriaga even played at a birthday celebration for Franklin Delano Roosevelt while he was president. 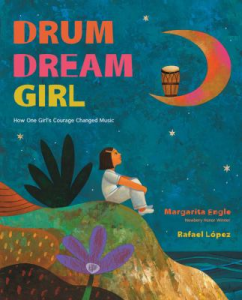 Drum Dream Girl is a beautiful retelling of Zaldarriaga’s story, illustrated with amazingly vibrant colors that will bring you to the island of music and it’s fantastic celebrations – check it out for a wonderful story on the power of courage and following your dreams.